When the silky white starch was first milled from the center of the corn kernel almost 200 years ago, creamy puddings soon became common desserts. My grandmother’s 1912 cookbook suggests a vanilla pudding topped with poached fruit. Here was a quick, inexpensive pud that didn’t demand stoking up the oven or rolling pastry. One hundred years later, grocery shelves displayed little cardboard boxes of cornstarch pudding mixes, and school cafeterias featured small, stemmed glass bowls of chocolate, butterscotch and vanilla pudding. Though tempting to view, the box pudding was usually, artificially flavored and cloyingly sweet. Now that we’re really ready to walk away from prepared food, we can retreat to the original heirloom cornstarch puddings. We can lighten the sugar, intensify the flavor with real chocolate and make a nursery dessert something special for all ages. 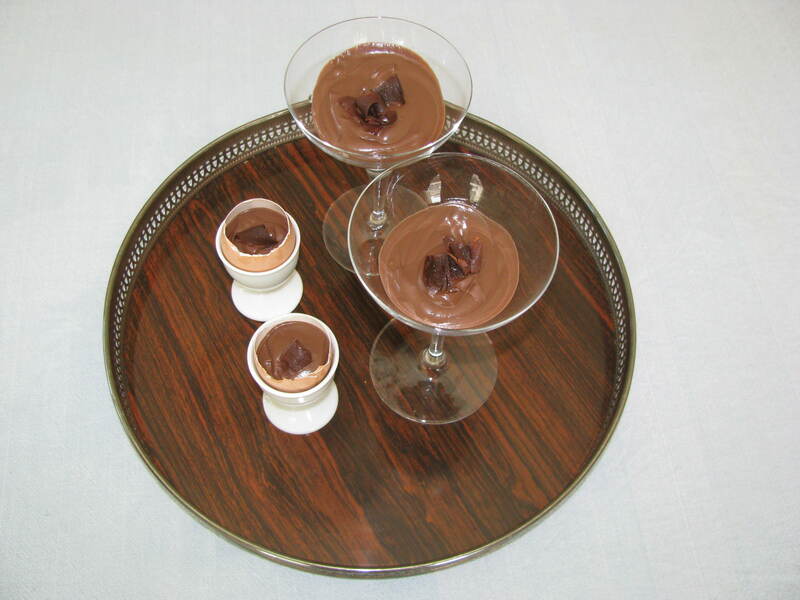 My granddaughters are delighted with chocolate pudding presented in stemmed martini glasses. For elders preferring a small serving, a rinsed eggshell half filled with pudding and nestled in an eggcup will make a perfect amount. Pretty recycled jam jars filled with homemade chocolate pudding make gifts to lighten anyone’s midweek blues. Chocolate pud’s not a place skimp on richness when you’re looking for full flavor. Use whole milk or add a tablespoon of butter along with reduced fat milk. Cream is lovely but optional, and if possible, select a fine eating chocolate. In a small bowl combine the sugar, cornstarch, cocoa and salt. Stir with a small whisk to remove all lumps. Blend in cream and egg yolks. In small heavy saucepan scald 1 cup milk. Pour in the cocoa mixture, scraping everything from the bowl with a rubber spatula. Whisk to evenly combine then remove whisk and continue to stir in a figure-8 motion with a wooden spoon. Cook over moderate heat until the pudding thickens evenly and pops at least one boil bubble. Remove from heat and stir in chopped chocolate. Cool slightly. Stir again to evenly blend in melted chocolate; add vanilla. Divide into dessert cups or pour into a serving bowl. Decorate with curled chocolate if desired. Makes generous 2 cups, 4 to 6 servings. There’s that time when nothing will do except a piece of good cake. I try my best to refrain from sweets and snacks, but when I sit quietly with my afternoon cup of coffee, even the tiniest bit of cake will suffice. We’re limiting butter and sugar intake, so I look to dried fruit. There’s nothing closer to fudge than sticky dates and when paired with nuts, we have a satisfying confection. To bring the cake part into the picture, I bind dried fruit with just enough light batter to hold it together. Since there’ll be a bit of sugar involved, I choose an unrefined sugar with substantive flavor like Indian Jaggery or Mexican pilloncillo, raw sugars that taste like melted toffee and when rubbed between your fingers almost melt into fondant. Piloncillo comes in small brown cones usually found in cellophane bags displayed along with chilis in the Mexican products section of a supermarket, and you’ll find Jaggery in large or small lumps in Indian markets. Both of these sugars must be grated using the small holes of a box grater before mixing. It’s a little extra effort, but the result brings a wealth of flavor and a great respect for the sugar. This cake contains no butter or any fat beyond egg yolk and nuts. It has a small amount of flour and can easily take in the added benefit of ground flaxseed. It keeps well wrapped and stored in a tin and is a welcome find several days or weeks later when the flavors have blended and the cake remains soft. Line two small loaf pans (3 by 6 inches) with parchment or butter and flour the tins. Preheat oven to 300º. Stir in vanilla and salt. Sift over the flour, soda, baking powder and fold in. Add flax seed if desired. Evenly mix in the dried fruit and nuts. Spoon, scrape and press the cake mixture into the two prepared loaf pans, dividing equally. Bake in the preheated 300º oven for one hour or until golden and tests done. Remove cakes from pans leaving parchment intact. Cool thoroughly and store in a tin or plastic box at least 24 hours before slicing, if you can stand to wait. Several years ago my friend Jodie returned from Findlay Market in Cincinnati with a technique for cooking greens gleaned from another shopper. I’ve been using this method ever since and have never found anything better. It’s simple, quick and no vitamins go down the drain. Greens offer vegetable variety, supplement bean or rice dishes, lighten stews, serve as beds for grilled fish or meats or even take part in fillings for tacos, omelets or quiche. If you’re looking for ways to add calcium to your diet, remember collards have more calcium than any other green vegetable. Keep these lush greens in your home veg routine. Wash the greens and trim the stem ends. V-out or pull the leafy green part from the stems and separate. Thinly slice the stems (about 1 cup); halve the large leaves and slice into ribbons (about 6 cups packed). Heat the olive oil in a large heavy pot (stainless steel or enameled cast iron). Add the garlic and stir until it releases its fragrance. Stir in the sliced stems, sprinkle with salt, add water, cover and cook briskly 5 minutes. Uncover and add the sliced leaves and another pinch of salt. Cover and steam cook until leaves wilt. Stir, cover and continue to simmer 5 to 15 minutes or until the leaves are tender. Just before serving add a few drops of lemon juice or a dash of good vinegar if desired. Enough for 3 or 4. Braised greens reheat well and often taste even better the next day. To increase the recipe, double everything except the water and allow some of the leaves to wilt before adding the remainder if the pot seems too small. You are currently browsing the Mary Jo's Kitchen blog archives for April, 2010.